A former chemistry student digs with small tools, the size of those a dentist might use, next to an aspiring business titan from another life, who lightly brushes away dirt clods with almost maternal care. "Sometimes I'll be working, and three or four hours will fly by," the former business student says. "It's absorbing." Both are part of a team working to record and analyze the remains of over 125 patients buried on the historic grounds of Eastern State Hospital, the second-oldest psychiatric hospital in the United States. David Pollack, director of the Kentucky Archaeological Survey (KAS) and adjunct professor of anthropology at the University of Kentucky, has brought together professional archaeologists and anthropology graduate and undergraduate students for the project. Pollack and his team of 10 braved cold in February and storms in April to properly document the 25-foot-by-150-foot rediscovered cemetery. The remains are believed to be those of ESH patients who died between 1840 and 1865. "Archival documents, and the types of buttons and clasps found with the bodies not only give us some idea of the types of clothing people were wearing when they were placed in their coffin, but also a date range for when they died," Pollack said. Pollack and his team encountered more than double the number of graves he expected to find when the project began. Still, he keeps the team moving forward, with the detail and precision of a general on a battlefield. From his observations, the graves themselves are regimented as well, laid out in three long rows. The grave shafts range in size, from 2 feet by 6 feet to 30 feet by 6 feet, and contain the remains of one to 10 individuals, most having two or three. 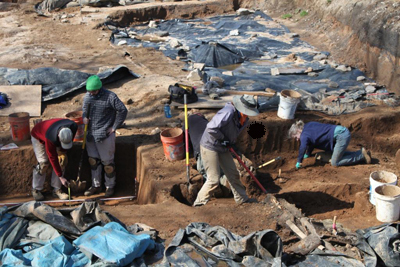 The number of mass graves surprised the archaeological team. Some have suggested that outbreaks of cholera and dysentery in the mid-1800s might have prompted Eastern State to use larger grave shafts. It is also possible that the large shafts contain the remains of individuals who died in the winter and could not otherwise be buried until the ground thawed. "It’s not like they just threw the bodies in," Pollack said. "There was a lot of effort put into seeing that everyone got a proper burial. Each person was carefully laid out in a wooden coffin, and they were often buried wearing their best clothing." Eastern State Hospital first admitted patients in 1824 and today houses around 150 patients. In the 1870s, a new cemetery was established in an area of open fields to the north of Loudon Avenue. The old cemetery near Newtown Pike was no longer maintained, and over the years its location was lost to history. In 2005, crews encountered human remain below a roadway during water-line construction. At that time, KAS archeologists documented a mass grave containing the remains of 10 individuals. The recovered remains were subsequently reinterred in a marked cemetery on hospital grounds. In 2008, it was decided that Eastern State Hospital would relocate to Coldstream Park and a new Bluegrass Community Technical College campus would be constructed on the existing hospital grounds. At that time, the Kentucky Finance and Administration Cabinet contracted with KAS to undertake an archaeological and architectural survey of the entire property to identify and evaluate significant archaeological resources, identify additional unmarked graves and to evaluate the significance of the historic structures. This work resulted in the identification of several areas that contained significant archaeological deposits. It also identified several areas under pavement, including the area where the mass grave was found in 2005, that needed additional work. In January, once the Newtown Pike entrance was closed, crews preparing for the BCTC construction began removing the pavement under the supervision of KAS archaeologists. Neither they nor the Finance Cabinet were surprised when additional graves were found. They were surprised, however, by the size of the cemetery. 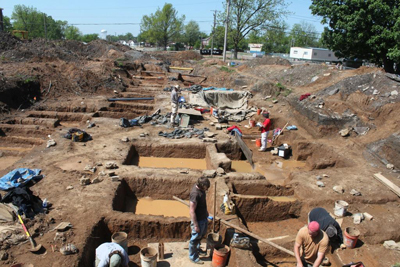 The Kentucky Archaeological Survey is a joint effort of the UK Department of Anthropology and the Kentucky Heritage Council, which works other state agencies, local governments and non-profits to document and investigate archaeological sites, as well as developing educational materials and programs for graduate school students and the public. Hospital excavations began in late February, and the KAS team finished in May.